Full of bright, bold flavours and farm-fresh veggies, this Mediterranean Bread Salad is a classic salad with a simple twist. Instead of pita bread, this version uses readily available crackers for a bit of crunch. Place crackers in single layer on baking sheet. Broil 1 min. or until lightly toasted. Break into small pieces. Combine next 6 ingredients in serving bowl. Mix dressing and lemon juice. Add to salad; toss to coat. Add crackers; mix lightly. Refrigerate 1 hour. Prepare using Kraft Organic Zesty Italian Vinaigrette. Prepare using Christie Wheat Thins Crackers. 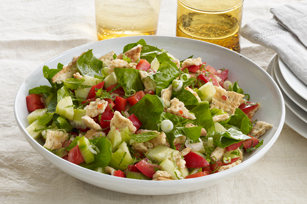 This fresh take on a Mediterranean classic provides an excellent source of vitamin C from the red pepper.